You Are Here: Home » random barks » Dogs Who Read, Read Bark! I don’t read much, but my owners do. They are big fans of Bark magazine http://www.thebark.com/content/magazine, which has as its motto, “Dog as My Co-Pilot” — a sentiment I can really get behind. Each month the magazine features entertaining and informative material on dog breeds, training and the sheer joy of canine/human companionship. The current issues has articles on fostering, dog DNA, winterizing your dog’s coat and, a topic of particular interest to my talkative family, “Do Dogs Understand the Meaning of Words?” There’s also a blog, http://www.thebark.com/content/good-dog with fun photos and this month a great guide to pet and people gifts. http://barkdoggifts.tumblr.com. 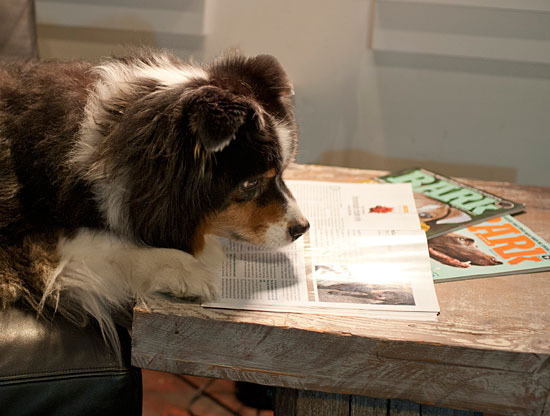 Check it out: A subscription to Bark for your favorite dog lover might just be the ticket.